Yesterday I showed some some options for adding interest to your bookshelves by adding color or pattern to the back. And as promised, here's my latest shelf update. 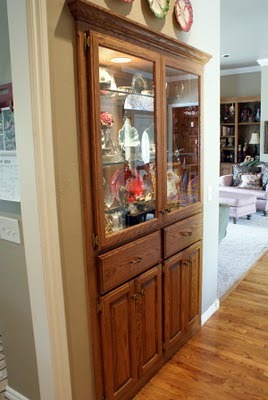 There is a built in china hutch in my hallway, and even though I have another china cabinet in the Dining Room, the storage of this one comes in handy as well. 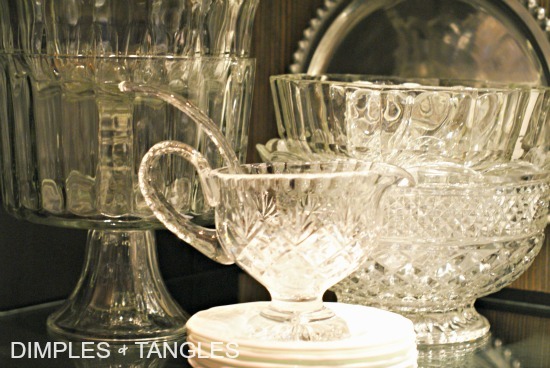 I love dishes and have gathered quite a collection of serving pieces, which I use regularly for entertaining and parties. 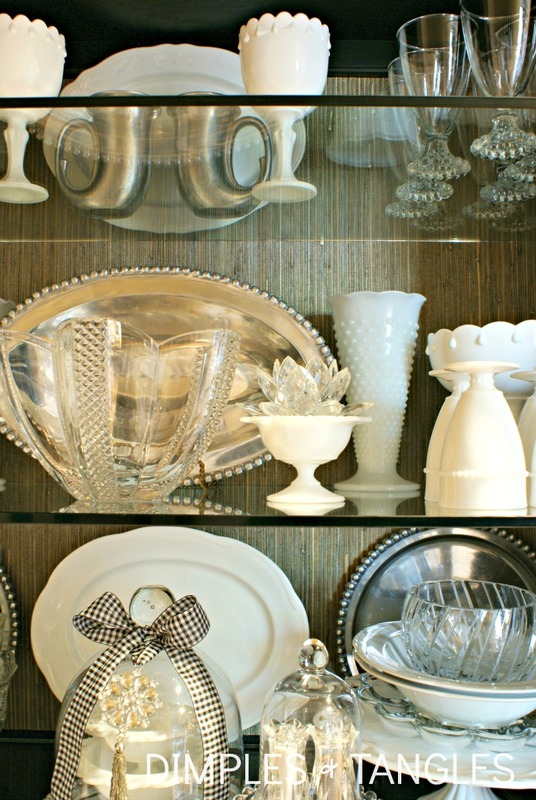 Many of these are thrift store finds or wedding and birthday gifts, and I've collected some pewter pieces from one of my favorite haunts when we go to Dallas. 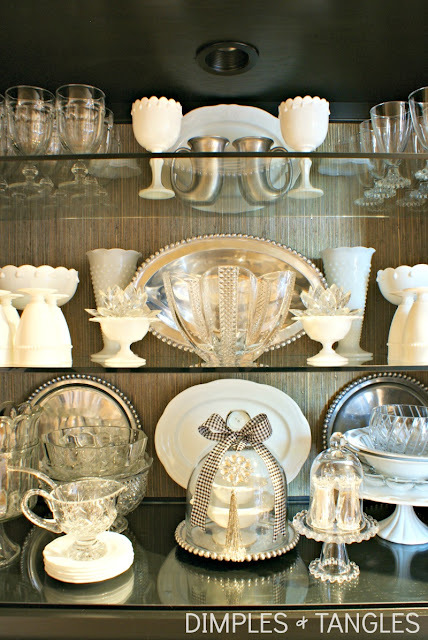 I used this image from Pinterest as inspiration, and decided to pull many of my serving pieces out of the lower cabinets and pile them together for display. Most of these are pieces I use all the time so this arrangement gives me easier access. and about 4 years ago I painted it black and added a green and white damask fabric to the back. Although the green fabric was perfectly fine, I was ready for a change. I found this roll of fabulous old grasscloth at a thrift store for a few dollars and was saving it for just the right project. At first I cut the paper and hung it with the grass going horizontally, but I had to patch another piece in to get the right width. Seams never match well with grasscloth, and it was driving me crazy. So, I tried the paper with the grass running vertically and it fit perfectly. I used Scotch poster tape and just cut the paper to size and taped it to the back. Easy! I like the texture of the grasscloth and the quieter neutral background. With everything going on in this hallway (mirror wall here), it needed to be a little less busy. 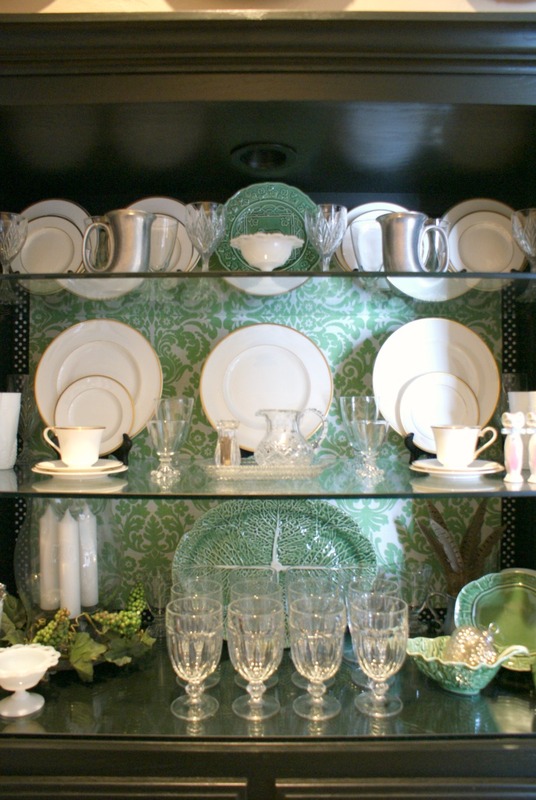 I also removed a collection of green and white plates that were hanging over the china cabinet. The kids are out of school tomorrow, so we're planning a few projects and lots of play time. I'm skipping out tomorrow and will see you on Monday! Thank you so much friends for your continual kind words, encouragement and support by following along with my decorating adventures! Stunning Jennifer. Wow! I love the neutral look with all the sparkly glass! Have fun on your long weekend!! 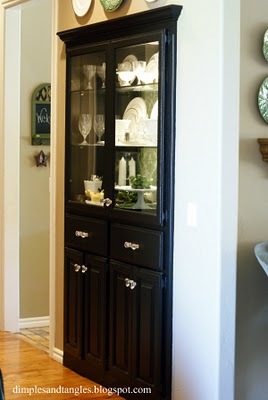 I love grasscloth and it looks great in your cabinet! 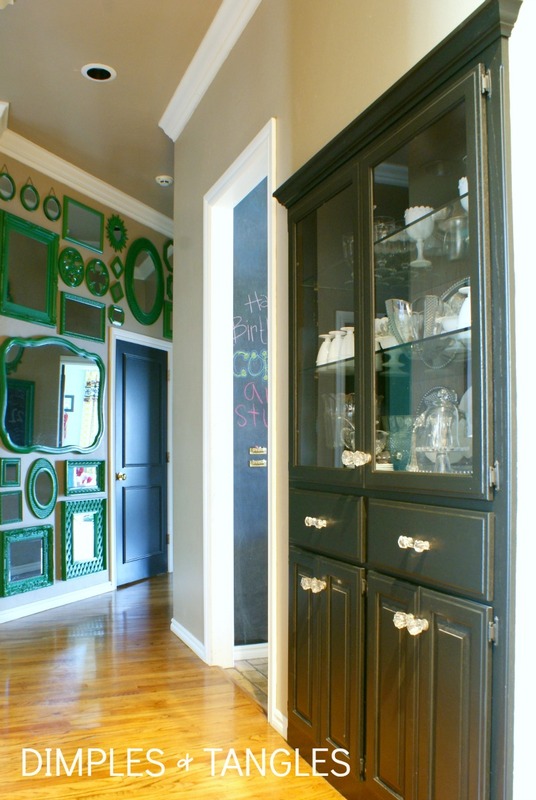 I also love that wall of mirrors! Enjoy your weekend! This is absolutely perfect. And the shot with the green framed wall- I Die!!! 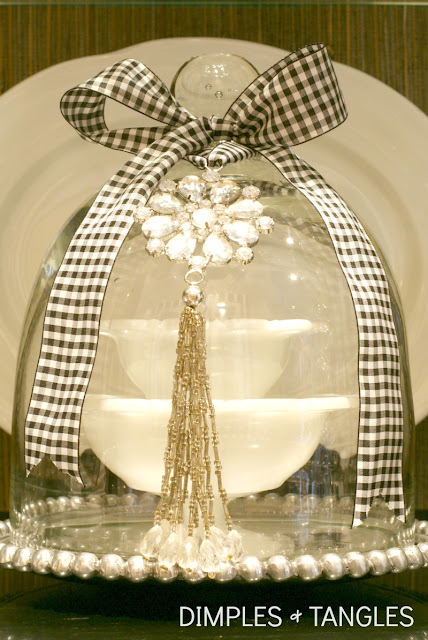 Love it and now I am wanting to go restyle my milk glass collection with some glass and pewter! Thanks! Nicely done! Enjoy your time with the kids! I love the grasscloth as a background!! And that built in is such a beautiful feature of your home. I don't think there is one spot in your home I don't love. I could move right in there with you and be quite content!! 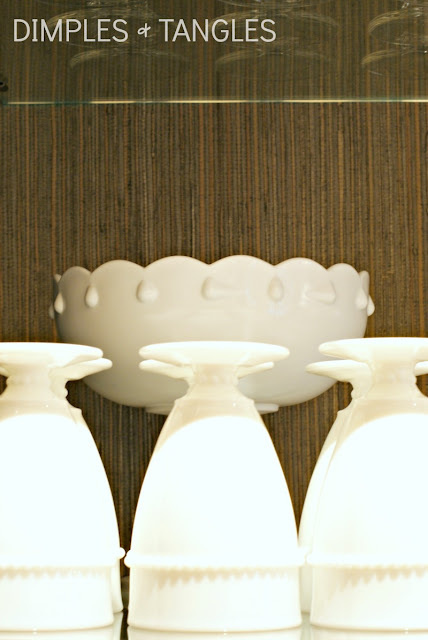 Love grasscloth! This looks really pretty, subtle and luxe and just perfect across from those amazing mirrors! No surprise you were ahead of the trend doing that four years ago! 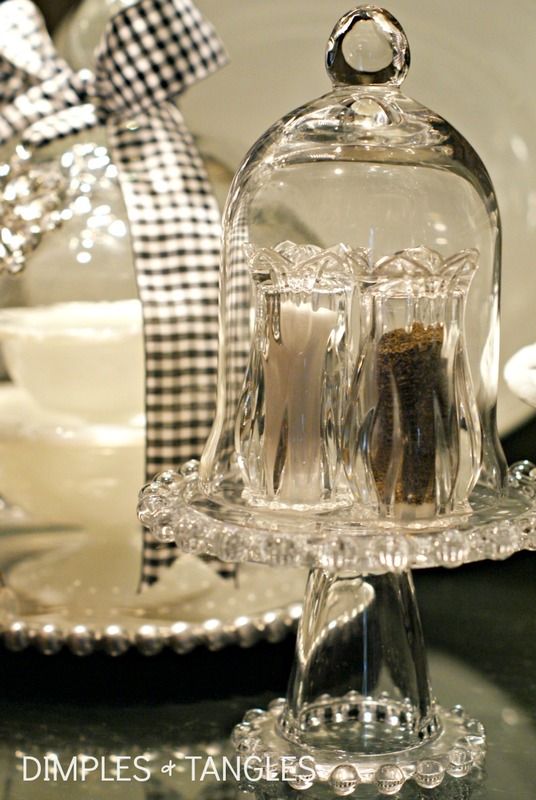 Love the natural grass cloth texture paired with your pewter and glass! Happy weekend! 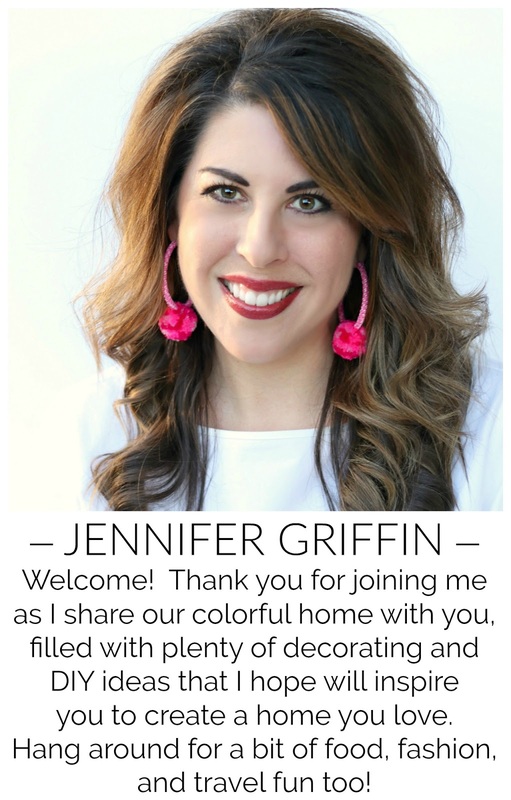 Jennifer, the grasscloth looks great! I love the texture that it adds! Very pretty! the grasscloth is perfect! love how it looks! I am a huge fan of grass cloth and seeing this project makes me brave enough to try it in my hutch! I hope you guys have a great weekend together! The look of the grass cloth is perfect! OOOOO I like that too! 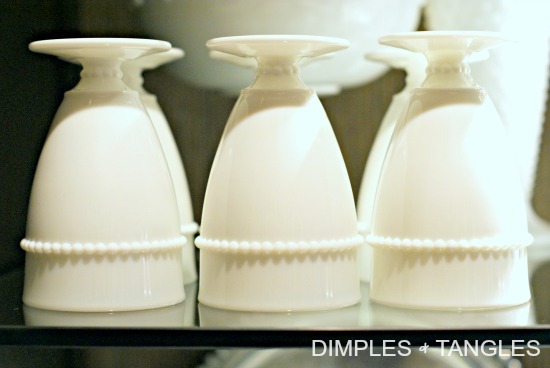 I've been thinking about lining the inside of my china cupboard with something - since hubby still says no to painting it. 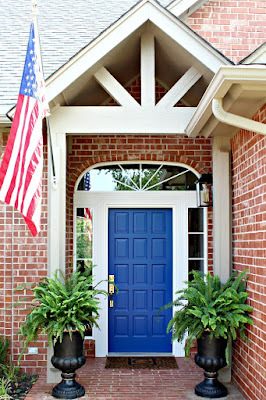 I have been crushing on grass cloth lately and this looks just perfect! You never cease to amaze! 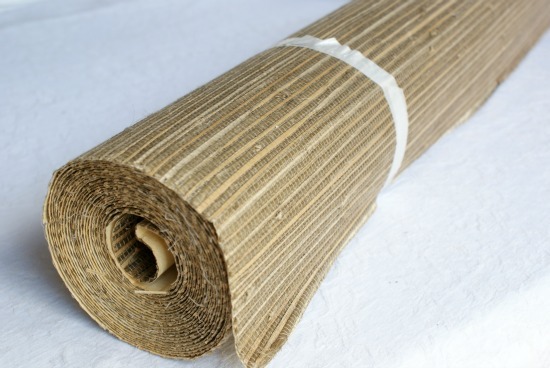 Oh I just love the look of grasscloth! Nice choice! Not sure how I missed this but I love it! Such a nice built in and the black paint looks awesome. The grass cloth is a pleasant change I'm sure, although I like the green too. Such a neat idea to do this!